Laozi (UK: ; US: ; Chinese: 老子 Mandarin pronunciation: ['làu̯'tsɨ̞]; literally "Old Master"), also rendered as Lao Tzu ( or ) and Lao-Tze (), was an ancient Chinese philosopher and writer. 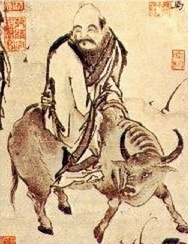 He is the reputed author of the Tao Te Ching, the founder of philosophical Taoism, and a deity in religious Taoism and traditional Chinese religions. His priority did not seem to be to teach them what he knew, but rather to impress upon them that nothing, not even... knowledge, was foolproof. Man is the only animal whose desires increase as they are fed; the only animal that is never satisfied. He who loves the world as his body may be entrusted with the empire. The law is not so much carved in stone as it is written in water, flowing in and out with the tide. It was the boast of Augustus that he found Rome of brick and left it of marble. But how much nobler will be the sovereign's boast when he shall have it to say that he found law... a sealed book and left it a living letter; found it the patrimony of the rich and left it the inheritance of the poor; found it the two-edged sword of craft and oppression and left it the staff of honesty and the shield of innocence.